TVUPlayer is a live streaming TV viewer client from TVU Networks, an Internet company based in Mountain View, California, which offers high quality global live television service that can be watched on your Windows PC or laptop over a broadband Internet connection. For cable and satellite TV addicts, or audience at the location where free-to-air TV channels are simply not enough or have only poor programs screening, TVUPlayer is definitely a good news as it brings you popular programs from around the world that you can’t get from your local cable and satellite providers, such as news, sports, lifestyle and movies from around the world. Best of all, TVUPlayer streams your favorite cable and satellite TV signals to your computer for free without having to pay any subscription fees. And TVUPlayer is one of the few online P2PTV that is not based in China, such as PPLive, TVAnts and PPStream. TVU Networks describes TVU Player uses a new broadcast technology called Real-Time Packet Replication. In essence, it’s actually P2PTV which based on peer-2-peer (P2P) technology where all viewers who are watching a channel at the same time are cooperating to give everyone the best possible signal. TVU’s application does not create any new files on your hard disk because you’re watching live TV. Channels that are featured on TVUPlayer include CBN (Financial), Fashion TV, ESPN Sports, ESPN (Asia), Star Sports, CCTV-5, CCTV-8, HBO Fox, NBC, Cartoon Network, ABC, CBS, HunanTV, CSTV, NHL, Telecapri (Italy Sports), USA Network, RTL All Music, ONTOP TV (Music), NBA TV, E-Music (Harik), XinZhi, Class News (Italy), DW TV (German), Al Jazeera, CNN, Phoenix Info, StarTV, Phoenix CN, CTITV, KNNSBS (Korea), AXN, Hollywood Movie Channel, East TV, Music+, HuaYu, Channel V, Disney (Mandarin), Comedy Central, Animal Planet, TeleMundo, CCDV, ABC 9 – KCRG, FM915 and many more. 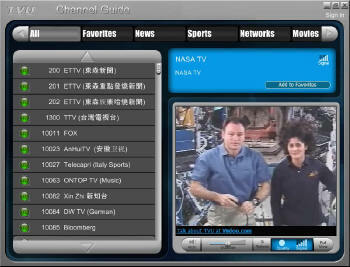 One of the feature that common with most P2PTV nowadays is ability to broadcast user’s own video stream. TVUPlayer has such a capability for viewers to become broadcasters using TVU networks’ free Broadcast application. The channel created users, including streaming of free-to-air, cable or satellite TV in your regions using basic set-up allows any number of viewers world-wide to watch your channel. Update 2: TVU Networks shut down service to the TVUPlayer on February 25, 2013, making it no longer available.